I finally finished him! This is Uruha from the J-Rock band The GazettE. I wanted to post him before I left for a few weeks. Done in about 3 days of work. Wow. Looks exactly like the photo. Oh, wow, this is stunning! Especially the lace, it's perfection! Perfect!!! So Beautiful!!!! 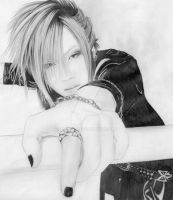 I love Uruha!!! You are incredible!!! Great work!!! the gazette members should be proud of you you make so excellent artwork about them. good work. Wow. that's a very high compliment. Thank you so much!! That's quite a high compliment! Thanks! Wow you're so good at drawing portraits! I thought it was a photograph! Wow, I thought it was a picture until I saw it was a "traditional art" piece!! Very nicely done! 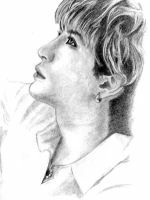 this is amazing!^^ it really looks like him! this is sooooooooo beautifull O.o really amazing artwork ! OMG! At first glance, it was like a black & white photograph! YOU DID THIS IN PENCILS??!!!! AMAZING!!! The details on the glove and jewelries are amazing! 0.0 woah dayum you are amazing. Fantastic stuff! You got the likeness down really well! The detail is amazing.... and the glove *O* Wow... it must have required a lot of patience to draw it so precisely! And the jewels too! Awesome!! !